Sweden’s long summer days and cool nights out makes it one of the best places to visit in Europe come the longest day of the year. “Would you stay home on night like this?” she asked, gesturing to the floor-to-ceiling windows framing the sunset over the city skyline. I had arrived in Stockholm with grand hopes for the Midsummer holiday. Back in the dark days of February when I booked my trip I was envisioning a Stockholm packed for the holiday, full of people out on the streets, partying under a warm, midnight sun — a sort-of Scandinavian Mardi Gras. I was nearly right about the midnight sun (it gets dark shortly before midnight and becomes light around 3:00 a.m. — an unwelcome sight for late-night revelers), but I was not so right about the warmth (June can still be quite chilly) nor was I right about the raucous street parties (the city actually empties out come Midsummer). But, as other expectations go, it was already clear to me that Stockholm was living up to the hype it’s been receiving as Scandinavia’s emerging capital of culture, with its thriving music and arts scene, a bustling nightlife, and a fondness for innovative design known the world over. Those images of Sweden that I had before my trip quickly became reality as soon as I arrived: Nordic efficiency, gorgeous blonde people, spotless cityscapes — it was all there. The subway system was amazingly efficient and each train line was designed with a distinct motif in mind; my line seemed to be inspired by Atlantis, adorned with faux Greco ruins and lit with soft shades of indigo and jade that created an ethereal ambiance. The people that I saw on the streets seemed to be unnaturally beautiful, as if they’d stepped out of a Ralph Lauren catalog (and, I might add, were on average a good half-foot taller than me). And the sidewalks and parks were shockingly clean and tidy, even around the most trafficked parts of the city. 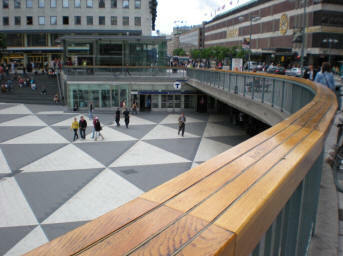 After leaving Centralstation, Stockholm’s main train station, I walked to nearby Sergels Torg, the vast, black-and-white checkered open square set a story below street level where, beneath the gaze of people-watchers from above, commuters crisscross on their way to and from the subway. From here it’s a short walk along Hamngatan to the unofficial center of Stockholm — Kungsträdgården — the lush, narrow park that stretches south to the island’s edge. After grabbing a coffee at one of the French-style cafes on the pebble-stoned paths that line the park, I strolled through the park, walking past the giant digital screen that had been erected in advance of the large crowd expected later that night for the Sweden versus Russia match in the Euro 2008 tournament. Kungsträdgården was once the site of the royal vegetable garden, hence the name “King’s Garden,” and is located just across the bay from Gamla Stan (“Old Town”), the small island where Stockholm was founded roughly eight centuries ago and home to the iconic Kungliga Slottet (“the Royal Palace”). The palace, with over 600 rooms, is one of the largest in the world and dwarfs all other buildings on the tiny island. As I gazed upon the imposing structure from the park I wondered how many thousands of times larger the palace was compared to my tiny apartment back in New York. The most scenic way to get around the city is via water — this is, of course, a city of islands. There are a number of boats that give guided tours of the bay, but I saved my money and set sail on one of the commuter taxis that cruise from one island to the other, allowing you to disembark when someplace catches your eye. As we zipped around the bay we passed the medieval buildings lining the water’s edge on Gamla Stan, then along the precipitous cliffs that make up the northern edge of Södermalm. Finally, about fifteen minutes into the voyage, we came to the emerald island of Djurgården. One of the main destinations for visitors, Djurgården is home to some of the city’s best known attractions, including the sprawling re-creation of old-Sweden, Skansen, and the nostalgic amusement park, Gröna Lund. This is also where most of the city’s museums are concentrated, dedicated to such wildly varied topics as salmon migration, Nordic history, 17-century warships, and Astrid Lindgren, the revered Swedish author who created Pippi Longstocking — just to name a few. There is, quite literally, something for everybody. A few hours later I met up with a couple of Stockholmers for an evening out on the town to check out the nightlife that I’d been hearing so much about. We met at Centralstation and walked south across one of Stockholm’s many bridges to Gamla Stan. Here we meandered along the narrow, cobblestoned streets amongst the various shops and restaurants that call this medieval neighborhood home. Around every corner seemed to be another old square, packed with locals sitting at café tables eating dinner or enjoying an after-dinner drink. 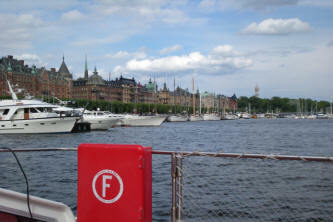 We continued one island south to the trendy district of Södermalm. Once home to the city’s working class, the neighborhood, like so many of its kind around the world, has been transformed by an influx of the young and fashionable into what is now the city’s center of nightlife. During the day the main thoroughfare, Götgatan, is crowded with shoppers visiting the many stores and designer boutiques along the street, but by night it’s packed with twenty-somethings heading out to the neighborhood’s many music venues, chic nightclubs, and eclectic restaurants. We had dinner at Debaser Medis, a restaurant/club in the center of Södermalm whose terrace overlooks the busy square of Medborgarplatsen, where, as we ate, we watched as the once crowded square below us emptied out as the night’s match approached. After ducking inside to check the score — Sweden was on their way to a 0-2 loss — we backtracked along Götgatan, turned down an empty side-street, and climbed a steep set of stairs, finally arriving at Mosebacke restaurant. Resting on a hill in the heights of Södermalm and offering a panoramic view of the city, Mosebacke’s patio is easily one of the best places in Stockholm to sit and watch the sun set with a group of friends during a summer evening. After a couple of Carlsbergs we decided to keep up with the theme of high-altitude drinks, and there’s probably no higher — or trendier — place in Stockholm for kicking back flavored Mojitos and Cosmopolitans than OHD, the skybar perched on top of the 25 story-tall Skrapan (as in skyscraper). 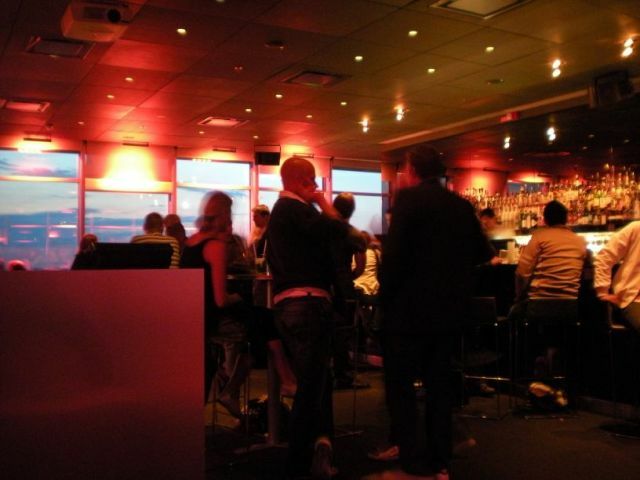 Once the headquarters for the city’s tax agency, the building is now home to over 400 student apartments which, needless to say, means that on any given night this loungey bar is likely to be a rollicking place for a few drinks high above the city. It was just past midnight and the sun had finally made a full retreat, casting a short-lived shadow across the city. To celebrate this rare occurrence we hailed a taxi and headed back into Norrmalm to East, one of the many upscale restaurants that call this posh neighborhood home. 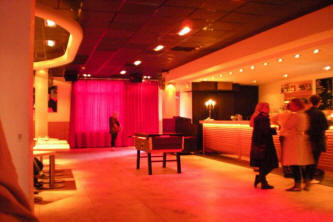 A premier restaurant serving pan-Asian dishes family style, East turns into a lively club by night’s end, cramming Stockholm’s well-dressed and well-connected into its bar where they can get down to a mix of reggae, Swedish pop, and hip-hop well into the late-night hours. After working up a sweat on the makeshift dancefloor, I made my way to the small terrace outside to cool off. I checked the time and was amazed to see that it had been almost one full day since my plane had touched down. Was I missing the relatively long nights that I was so accustomed to in the summer? Not one bit, I thought to myself, with days like this, who needs the night?